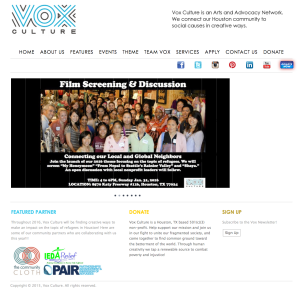 It was great to be recently contacted by a Houston based arts and advocacy nonprofit organization Vox Culture Link whose mission is ‘to connect the Houston community to social causes in creative ways’. They’d reached out to me to ask permission to include a short video I’d done as a part of an event that they were using to open up a yearlong focus on refugees in the Houston community. My piece was about Seattle’s Bhutanese Refugee Community. I’d told the story of one newly arrived family that included a visit to the refugee camp in Nepal where they’d lived for the past 17 years, showing the cultural training they go through prior to departure, medical screenings, and the actual journey. Then to their new lives here in Seattle, their housing, jobs and assimilation experiences. With lots of misconceptions and lack of information about refugee resettlement overall in the US, and the Syrian refugee crisis dominating the news, they saw my piece as a good tool for educating Americans about what this process actually looks and feels like. Back in 2009, I’d done a series of stories for my local TV station the Seattle Channel, connecting Seattle and Nepal. This was one of 3 stories, the other 2 being about a local nonprofit who works to battle the stigma of disability in Nepal, and another was about a young Tibetan monk who’d left his family in Seattle at a young age to follow in the family’s long lineage as a revered Buddhist teacher. The disability story was eventually nominated for a regional Emmy award. The goal of our 2016 series, Connecting our Local and Global Neighbors, is to engage in a deeper conversation on the subject of refugees. Vox Culture will launch the series with an event featuring short films and an open dialogue session on topics related to Houston, refugees, and how we can work together towards the improvement and continued development of our own community. Please note that we are expecting around the range of 50-100 people (combination of our volunteers, community partners, and interested members of the public) in attendance, and that WE WILL NOT be charging our audience members NOR asking for any donations pertaining to the specific event. We would like to use this specific film as part of a point of general discussion that is to follow. Bhutanese Refugee Story – From Nepal to Seattle's Rainier Valley from Pangeality Productions on Vimeo. Challenging The Stigma of Disability in Nepal with The Rose International Fund for Children TRIFC from Pangeality Productions on Vimeo. Young Lama & Future Tibetan Spiritual Leader, Asanga Sakya Rinpoche from Pangeality Productions on Vimeo.